My family and friends often share recipes of their newest creations, since they know that I absolutely love trying these out as well. 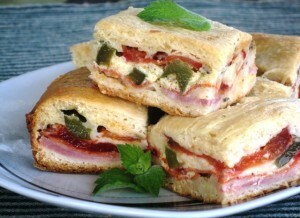 Today I will share a recipe for Antipasto Squares , recommended by a friend. It is a very simple dish to prepare, and quite tasty, but I would not consider it light in calories. Antipasto Squares make an interesting addition to a brunch menu, or as a Super Bowl party appetizer. The original recipe calls for Salami and Olives, but since I do not like either of these ingredients, I added green peppers and tomatoes instead. These ingredients can easily be substituted with your other favorite meats, cheeses and vegetables, or even make it a vegetarian dish. My version of this recipe is posted below, for you to try out, and please share your comments. Grease a 9 x 13 pan with Pam cooking spray, or Crisco shortening, and set aside. Open one package of Crescent Rolls dough, and unroll onto the bottom of the greased pan. Pinch dough together at perforations, to form a solid bottom layer. Layer ham evenly over the dough. Place Provolone cheese slices over ham. Layer Pepperoni over the Provolone cheese. Place Swiss cheese slices over Pepperoni. Top off with Red and Green Pepper strips. Sprinkle with Italian Seasoning, Basil and Onion powder. Sprinkle 2 Tbs. of Parmesan grated cheese. Spread sliced tomatoes, then sprinkle with ground Black Pepper and Garlic Powder. Pour beaten eggs over the top of the casserole. Top off with 3 Tbs. Parmesan grated cheese. Preheat oven to 350 degrees F, and bake 25 minutes. Also suitable to store in a refrigerator for a day or so, or wrap it well and freeze it for a later use. To reheat, use regular oven, toaster oven, or even a microwave. Had the Buffalo chicken wings recipe, which was fantastic. Looking forward to trying your version of the antipasto recipe. I am happy to know that you liked it as well….so far I have not met anyone who did not like this dip. Please keep me posted with you opinion about the Antipasto squares….Thank you for your time to share comments.